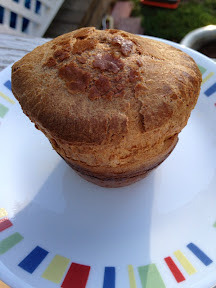 I was not all that excited for this week's Tuesdays with Dorie recipe; I think I've only ever had popovers once, the one time I baked them before, and I wasn't that impressed. But it couldn't be an easier recipe: toss flour, salt, melted butter, warm milk, and eggs into a blender (I was careful to be sure that my milk and eggs were both warm). Pour 1/4 cup into some buttered muffin cups (I did preheat my pan, given some comments on the P&Q). Bake. Eat. Seemed like it would be silly not to try the recipe. And I really enjoyed them! 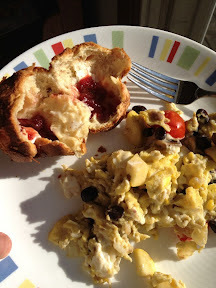 We ate them warm and buttered, spread with the last of my strawberry-honey jam, with our eggs. Delish! Hubby and I decided to join a CSA for the first time last year. We'd talked about it for years, and every year I would do a ton of research on local farms...and then get totally overwhelmed by the number of choices and give up. 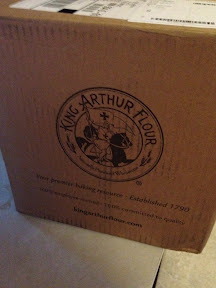 Finally, last winter, we bit the bullet: picked a farm and sent in our money. In basic terms, CSA consists of a community of individuals who pledge support to a farm operation so that the farmland becomes, either legally or spiritually, the community's farm, with the growers and consumers providing mutual support and sharing the risks and benefits of food production. Typically, members or "share-holders" of the farm or garden pledge in advance to cover the anticipated costs of the farm operation and farmer's salary. In return, they receive shares in the farm's bounty throughout the growing season, as well as satisfaction gained from reconnecting to the land and participating directly in food production. Members also share in the risks of farming, including poor harvests due to unfavorable weather or pests. By direct sales to community members, who have provided the farmer with working capital in advance, growers receive better prices for their crops, gain some financial security, and are relieved of much of the burden of marketing. Last year was not a good year for many of our local farms, so it wasn't the best for us either. It was too cold and then too hot and then too wet and then too dry...nothing much grew. 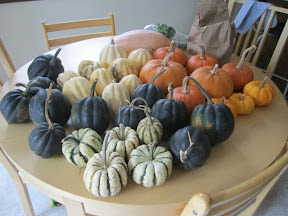 We got squash, squash, and more squash...and that was it. I appreciated that the farm wanted us to feel like we were getting our money's worth (as much as they could, given the weather), but it was way more than we could deal with. I made every zucchini recipe known to man, froze a bunch of sliced squash and no-noodle lasagna, made countless jars of pickles, gave a ton of food away, and still couldn't keep up. So hubby and I had a big heart-to-heart this winter; we knew that it wasn't fair to judge CSAs based on last year's experience. We decided to give it another try this year, although we switched to another farm that several friends had joined, knowing that they got a lot more variety than we did, even with last year's crazy weather. This summer has been a true CSA experience. This farm offers us an amazing variety of veggies each week, but not too much of any one thing (except maybe cukes). The farmer sends fabulously detailed newsletters each week, filled with farm news, recipes, and pictures of the interns working on the farm. We were a little overwhelmed by the amount of greens at the beginning of the season, until we started making green smoothies as an afternoon snack each day. Our box this past week provided us with this amazing meal: fresh tomatoes, garlic, carrots, celery, and onions went into this fresh tomato sauce. Scallions went into the cheddar and scallion rolls (twitterbaked with Kayte and Margaret). Fresh garlic, parsley, and basil went into the meatballs. 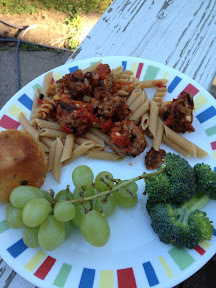 We ate delicious broccoli on the side. All of the veggies are incredibly fresh; I can't believe how much better everything tastes than when we buy them from the grocery store. Even the celery, which I think of as being so bland, smells and tastes so celery-y. The whole family is excited to see what we get each week, and the kids love asking which of our foods came from our veggie box. We still have many veggies to use before our next pick-up on Thursday. Farm potatoes and peppers will go with our grilled chicken tomorrow. Tuesday night's fried rice will include the rest of the broccoli, scallions, carrots, and cabbage. I gave two eggplants to my mom, I'll have to make another batch of pickles, and I'm waiting for inspiration for the giant bag of beets. 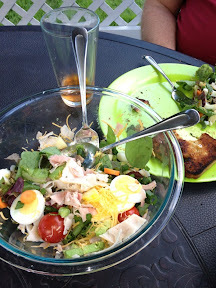 Which leads me to my final reflection: as wonderful as the food tastes, as much as I love the connection to a local farm, as much as I believe in the ideals of a CSA, I don't think we'll do it again. I miss choice; we get so much food that our meals are all determined by which recipe uses up the most farm veggies. This is especially challenging at the beginning of the summer when you get the same foods over and over (I could make this bok choy and kale recipe in my sleep!). I miss shopping at the farmer's market; although we still go, I can't justify buying additional produce when I can't keep up with what we have and when we've already spent so much money. And I can't stand the guilt of throwing food away when we can't get to everything, even though our farmer insists that it's still worth it and we're still doing good. Tonight I tried the waffle cone recipe from David Leibovitz's Perfect Scoop. Again I was surprised by how quick and easy the process was. DL's cones were much thicker than Jeni's and much less fragile. They also needed to cook longer, almost twice as long (1:30 as opposed to :45; Jeni's burned at a minute). 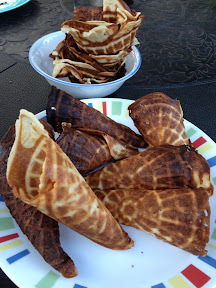 I'm glad to know I can achieve a thicker cone, even with the pizzelle iron. Hubby said he thought he preferred the taste of these; I actually preferred the taste of Jeni's, but liked the sturdiness of these. We enjoyed them with Jeni's darkest chocolate ice cream, with mini chips and cookie dough mixed in (inspiration thanks to Di). 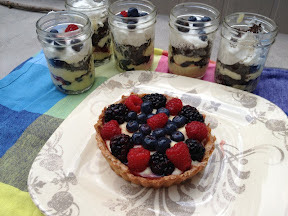 Summer dessert perfection. Our final category for ice cream week is original recipe. 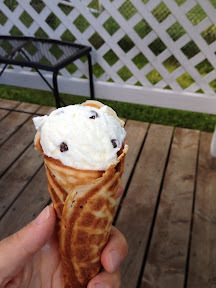 I have to admit that I was not nearly as creative as Phyl (Guiness stout ice cream), or Margaret (tea and biscuit ice cream), or Rebecca (baklava ice cream), but this is one of our favorite ice cream recipes for my very favorite ice cream flavor: mint chocolate chip. 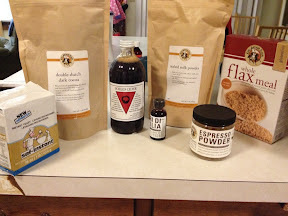 I follow Jeni's basic technique (see here), but leave out the vanilla bean and stir the extracts into the base at the end. After an overnight rest in the fridge, I churn it in my ice cream maker, adding the chocolate chips during the final two minutes of churning. I meant to do my final post for ice cream week today, but instead spent my day dealing with the over-abundance of produce from our CSA. The past three week's worth of beets became these chocolate beet muffins (thanks to Sara for tweeting about them yesterday, as I'd had no inspiration for dealing with the shelf full of red globes). They were a huge hit with the whole family, and I'm sure the extra cup of beet puree that I stashed in the freezer will be put to similar use soon. The drawer full of cukes became seven jars of bread and butter pickles, a hot packed version of these fridge pickles. I love the ease of refrigerator pickles, but just don't have the fridge space. 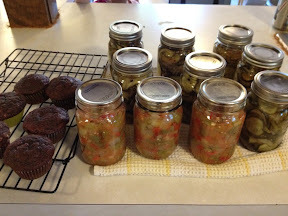 And finally, I revisited small batch canning when I received a bag full of tomatoes, a ton of green and hot peppers, and onions in this week's box: three jars of hubby's favorite salsa. For the first time, canning seemed more natural, less overwhelming. I didn't need to review the instructions every two seconds, and I made all of the salsa and almost all of the pickles without needing another pair of hands. Makes me feel more confident about the next over-flowing box of goodies coming my way! A year ago, my friend Di posted about getting her own waffle cone maker and I became obsessed. Which is funny, because I have never liked cones; I always order my ice cream in a cup. But suddenly, waffle cones sounded soooo good and I began ordering them whenever we went out. Finally, I decided to bite the bullet and use some of my remaining birthday money to buy a waffle cone maker. 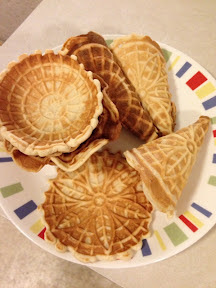 Well, after a lot of soul-searching ;-) and researching, I actually bought a pizzelle maker to use for waffle cones. The waffle cone makers come in 7-inch, which seemed huge for the kids, or 3-inch, which sounded too tiny to be worth it. Pizzelles are 5-inches, which seemed just about perfect. Plus my mother-in-law makes pizzelles each Christmas and I love her recipe (hint hint), so this way, I can make my own and I'm not spending money on a single-use appliance. Ta da! I tried Jeni's recipe (Di posted it here). It was so much fun. I made cones and little bowls, and not only did we love them with ice cream, but they were amazing by themselves as cookies. I ate an embarrassing number by myself. 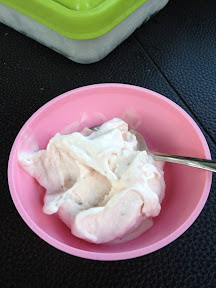 Check out Phyl, Rebecca, Margaret, and Di's actual sorbet/non-dairy frozen treat posts! Today's ice cream week theme is frozen yogurt, and it's no surprise (to me anyway) that I did a new riff on an old familiar recipe. 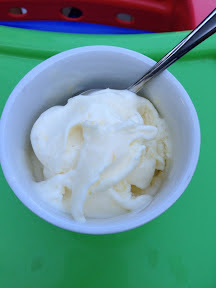 The one recipe that I look up on my own blog over and over again is this one for rich lemon curd frozen yogurt. It uses the instant lemon curd from KAF in the lemon froyo recipe from Jeni's book, and there is just something about the bright lemon flavor and the incredible creamy texture that just captures me.... 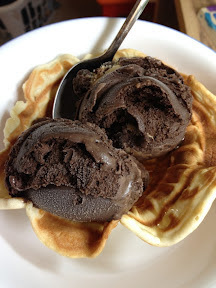 I am a chocoholic and normally won't even consider a non-chocolate dessert, but this is the one flavor of ice cream that I can't stay away from, continually sneaking into the freezer to have just one more small scoopful. 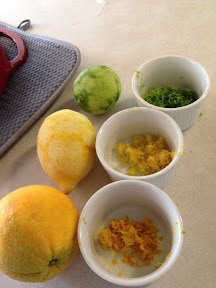 Before we went out West, I made a version in which I subbed in orange for the lemon. It was delicious and we ate it before I got any pictures, but it was definitely missing a little something. Today, I was thinking about both the lemon and the orange froyo, and when I opened my fruit drawer, I ended up pulling out the lime, too. How about a three-citrus frozen yogurt? Then I followed my normal process for making the curd and the froyo, again using a pinch of all three citrus zests in the ice cream base. Many of my Twitter buds started churning weeks ago, but with three weeks out West and a week at the cabin, I haven't spent much time in my own kitchen. Luckily, ice cream week was just the push I needed. Well, that and the pizzelle iron I just bought myself so I could make my very own waffle cones. When I took requests for ice cream flavors to initiate our cones, the little girl picked something with chocolate (no surprise...she's my kid!) 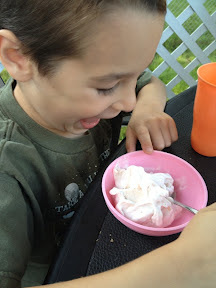 and the little guy picked strawberry ice cream. My little guy is a huge fruit fan (he calls himself a "fruitavore"), but he usually gets overruled by the rest of us. This time, I decided to make two flavors to make everyone happy. (The method is here.) This made 8 cups of base. I took out 5 cups to use for the chocolatey treat (post Friday) and 3 cups to use for the strawberry ice cream. To the 3 cups of base, I added 1/4 cup of buttermilk and 3/4 cup of strawberry puree that was in my freezer, leftover from some other recipe. The strawberry flavor really shone through, which is likely because I used much more puree than in previous recipes I've tried. This ice cream was a hit with both of my guys. Yum!